Will Hutchins on Warner Bros. 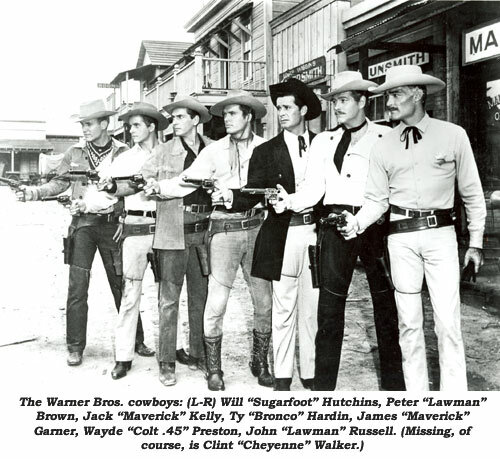 The toughest gang in the West was not the James Gang nor the Dalton brothers nor the Younger brothers—the toughest gang in the West was the Warner Brothers. They rode us hard and put us away wet. On weekends they’d send us out on public appearances for which they were paid handsomely and we were paid ugly. On one such weekend in the late ‘50s I found myself on a strange horse, about to ride in the grand entrance of a rodeo. I was sweet talking the horse and silently praying he wouldn’t humiliate me too much, when a real cowboy dressed in purple from hat to boot rode up next to me to calm my fears. He was Casey Tibbs, the world’s greatest saddle bronc rider of his day. I remember growing up in a gentler, carefree, smog-free Los Angeles, where you knew your neighbors for blocks around and Saturday movie matinees cost a dime. I’d whoop and holler as my cowboy heroes rode across the silver screen, guns a’blazin’. Movies were my religion; movie palaces, my church. Years later I hired on at the Bar WB ranch in Burbank, just one in a stable full of TV cowboys. Clint ‘Cheyenne’ Walker was our foreman. He trail-blazed the way for us. He was the king, the backbone of Warner Bros. TV. For some reason I reminded my bosses of Will Rogers, so quicker than a fast draw Marshall Hutchason became Will Hutchins. My real name was too long they said. Soon after, they hired Efrem Zimbalist Jr.! Once in awhile the producers would toss in some footage from the Warner film library to give the illusion of a higher budget. Then I’d get to dude-up in assorted outfits to match the stock shots. Over the years I had the privilege of wearing Walter Brennan’s shirt, Errol Flynn’s coat and Humphrey Bogart’s pants. I never felt comfortable in my own duds. Reminded me of Buster Brown. Never felt comfortable with scripts that made me too brave. I was a reluctant hero. When the writers went on strike the suits merely switched scripts and we’d all re-make each other’s shows. The writing credits went to the mysterious W. Hermanos (that’s Spanish for Warner Bros.). One day, before riding into another adventure of epic proportions, I gazed forlornly over the fence at a small bungalow, home of the Warner cartoon department—Alas! They were turning out the best shows in town and Bugs Bunny was the Super Star of the lot. Not long after “Sugarfoot” bit the dust (He flunked his bar exam), the entire Warner’s TV department went down the tube, followed shortly thereafter by most TV westerns. Yesiree, Bob, the TV cowboy craze had raced across the nation like a prairie fire and just as quickly had gone up in smoke. Never before in history were so many horses unemployed.